Dicey Reilly’s Irish Pub was the venue for a most interesting tasting of whisky, distilled in the north of Scotland by a family company. This was Glenfiddich, from the grey granite distillery, and one of the world’s most popular tipples. 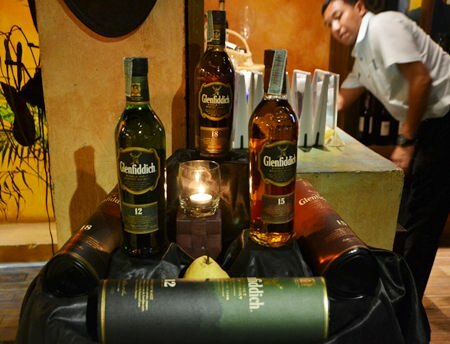 Glenfiddich is owned by William Grant & Sons, an independent family-owned distiller founded by William Grant in 1886. Today, the luxury spirits company is run by the fifth generation of his family and distils some of the world’s leading brands of Scotch whisky, including the world’s favorite single malt Glenfiddich®, The Balvenie® range of handcrafted single malts and the world’s third largest blended Scotch, Grant’s. The highly informative presentations gave the guests a real insight into the processes involved in creating a Glenfiddich Single Malt and of the distillery itself. 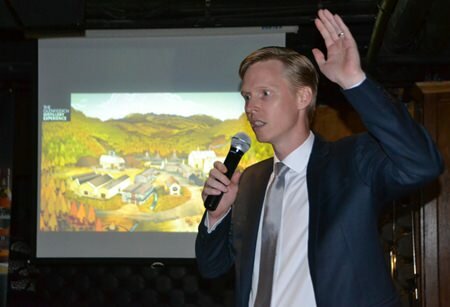 The facilitator for the Glenfiddich tasting was a fifth generation Australian Scot, Matthew Fergusson-Stewart, the regional brand ambassador. Matthew turned out to be a very knowledgeable young man who not only educated the 30 thirsty souls, but also kept their attention with his witty delivery. There were three ‘vintages’ of Glenfiddich to be appraised that evening, the 12 year old, the 15 year old and the 18 year old. Three single malt whiskies were served up for the tasting event, namely the Glenfiddich 12 year old, 15 year old and 18 year old. What was previously not well understood was the fact that these three are completely separate types of whisky. For example, an 18 year old is not a 12 year old that has been stored for the past six years, each of the three is matured in different ways. This means that an 18 year old Glenfiddich has been matured for at least 18 years, and in fact could be several years older, as opposed to the aging of wine in the bottles. 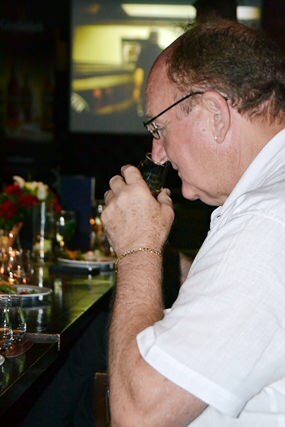 Matthew took the tipplers through the simple origins of whisky with the three ingredients of water, malted barley and yeast and then on to how the different years 12, 15 and 18 become individual whiskies. 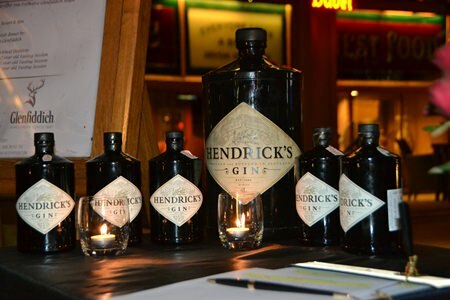 Although this was a Whisky tasting, guests were welcomed with a glass of award winning Hendricks Gin & Tonic. The 12 year old has its maturation in American and Spanish oak casks, the 15 year old is kept in sherry, bourbon and new oak and then left to marry in a Solero vat and the 18 year old matures in Spanish Oloroso casks and traditional American casks and then married in wooden tuns. Matthew covered the sometimes contentious subject of adding water to his whiskies. He personally drinks them neat, though the addition of a small amount of water is sometimes claimed to release the flavors even more. However, Matthew’s water addition was more like two or three drops administered using a straw as a pipette! 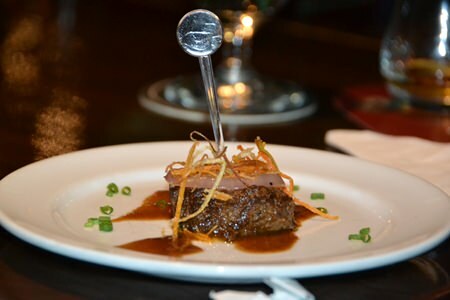 The chef at Dicey Riley’s complimented the tasting session with tasty snacks. As to be expected, the drinkers that evening were divided in their appreciation of the three different scotches, but the majority went for the 15 year old, and both Matthew and myself were in agreement with the 15. Following the education, the whisky drinkers then went outside to the terrace and continued sampling and enjoying the “uisge beatha”, the Gaelic for the “water of life”, otherwise known as “whisky”, and Glenfiddich in particular. 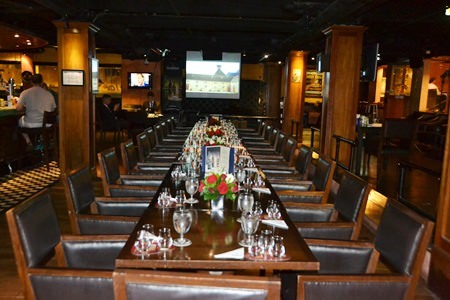 Guests were taught how to distinguish the characteristics of the three whiskies on offer. 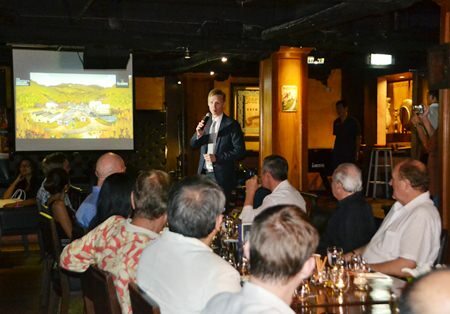 Brand Ambassador for Glenfiddich Matthew Fergusson-Stewart keeps the talk very interesting by interacting with the guests. Inside Dicey Riley’s the table is set to welcome those with a keen interest in Single Malt Whisky.